Have you ever heard the phrase “a 30-minute workout is only 2 percent of your day?” I resent that phrase. Yes, 30 minutes is a small part of our day, but this doesn’t factor in the 8-10 hours of work, the time spent commuting, taking care of kids or family, the 8 hours of sleep (if you’re lucky) and all the other moments of chaos that can eat up otherwise productive time during the day. Exercise is important, especially for Latina women and it shouldn’t be overlooked. 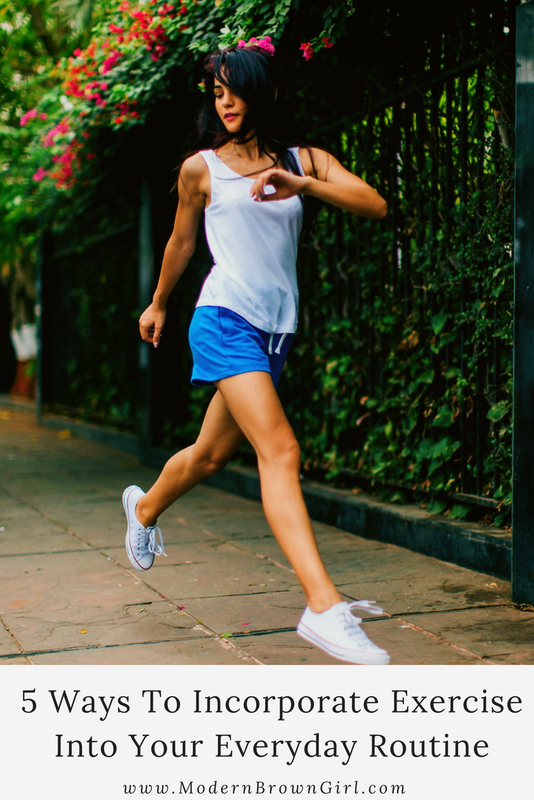 Here are a few ways you can sneak exercise into your otherwise crazy daily routine that won’t leave you feeling guilty about not making it to the gym. Dogs are the perfect workout companions because they need several walks a day and are always up to burn a little more energy. Visit the dog park in the morning or after work and do some lunges and squats while you throw the ball around. If the park has a bench, it’s the perfect opportunity for some chair dips or plyometrics. Whether you’re used to driving to work, taking the bus or train or dropping the kids off at school, use this time to challenge yourself with a new route on those two fine legs of yours. Map out your route to see what’s possible for your trip. If walking or jogging isn’t an option, try cycling! The American Dental Association recommends brushing your teeth at least twice a day for two minutes at a time. Use this time to do lunges out of your bathroom and through the hallway. Try to make it all the way to the front door and back to your bathroom before the time is up. Your legs will thank you for this during shorts season! If you’re like me, I spend at least 30 minutes a day on the phone with my mom, my sisters, or my comadres. Do a one minute wall sit during the call and focus on engaging your core. See if you can get them involved too and challenge them to compete for the most amount of time! Our phones, computers and TV shows eat up a lot of our time at home. Whether you’re scrolling through Instagram or catching up on your favorite TV show, work on your flexibility while you’re at it! Keep a yoga mat next to your bed or in front of the TV to remind you to get on the floor and get moving. Imagine how great it would feel to know you were active while still doing all the normal activities in your day! Are there any others we missed on this list? Comment below with your recommendation!